Click on Buy Now for current products and the link for at-the-farm pricing. Our pigs are raised on pasture and organic grain. They have outside access at all times. Their big floppy ears almost cover their faces and make them look as friendly as they are. Despite their lean, succulent meat, these pigs were near extinction a few decades ago because they did not grow fast enough for the needs of intensive factory farming. 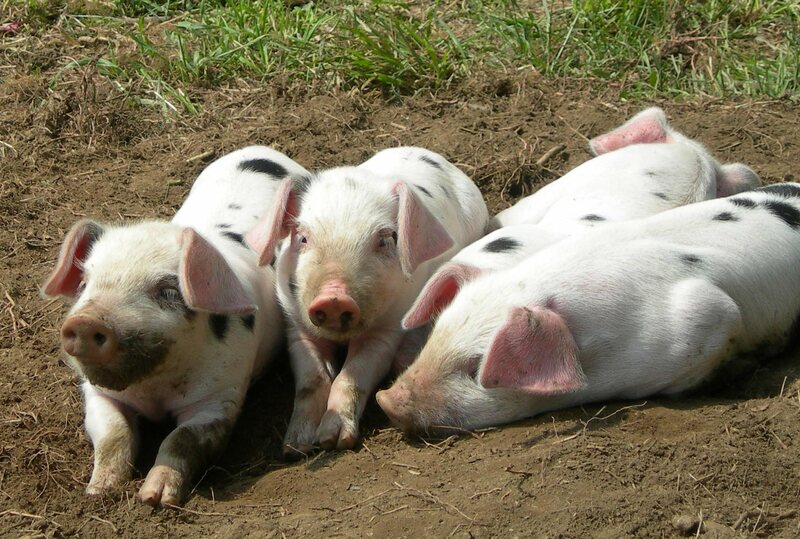 The Gloucestershire Old Spot Pig, or GOS, originated in a region in Gloucestershire, England, known as the Vale of Berkeley. Recognized as the oldest pedigree spotted pig in the world, the GOS was once popular with small family farms where they were raised on dairy by-products (such as whey) and orchard "drop fruit," giving these pigs the nicknames "cottage pig" and "orchard pig." Get additional information at Old Spot Breed Association of America. The American Livestock Breed Conservancy lists Old Spots as still "critical" for survival. We are raising these pigs to contribute to the restoration of these docile and useful animals to their place on the family farm. We raise Nubian milking goats, also known as Anglo-Nubians. According to the International Nubian Breeders Association the Nubian is believed to be the oldest breed of goat know to man. They are of African and Indian origin and get their name from Nubia in Northeastern Africa, or what is now known as Egypt and the Sudan. Hardy goats from this area as well as Arabia and India were cross-bred with English goats to develop the Anglo-Nubian. The Nubian is an all-purpose goat used for meat and milk. It produces milk with a high average butter fat content (over 4%). Learn more about dairy goats at the American Dairy Goat Association website. We make yogurt and cheese for our own consumption and enjoy the milk directly. 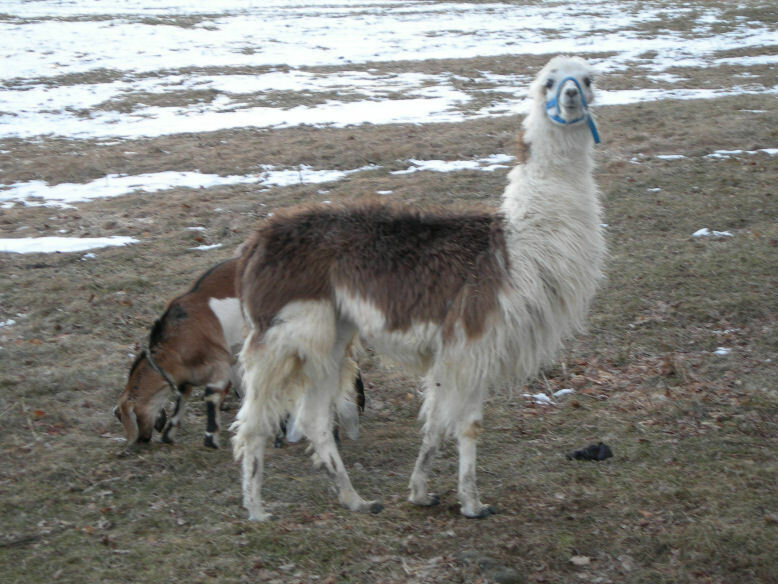 We keep one llama as a guard animal for our goats. We raise Dexter Cattle on rotated pasture and hay in winter. 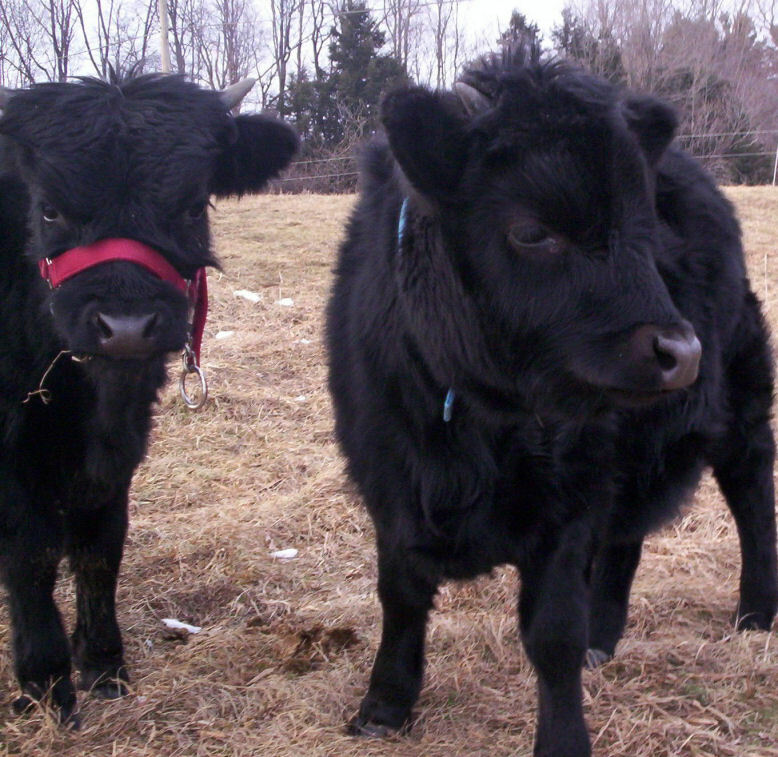 The Dexter is an ancient breed from the southwest of Ireland and most commonly believed to be a cross between the smaller Kerry cattle, (which were the original Celtic small black breed) and Devons from England. The American Dexter Cattle Association can provide additional historical information on these wonderful animals. Dexters have a very gentle disposition. They are used for milk, meat and farm work which made them most useful on the remote Irish homestead. They graze on a wide variety of field and forest vegetation and can thrive in quite harsh conditions. They are also used by many people for meat and eggs. We’ve never been able to gather many eggs from them, because they hide their eggs in the fields, and then go to sit on them once they have accumulated a critical mass. When one of the hens is sitting, her family will come to visit her, but we still often lose eggs or sitting hens to predators. We have a flock of Heritage Breed Chickens. They are free range and fed organic feed. Many of the old breeds of poultry, once a colorful sight on family farms, are now rare because they did not conform to the particular requirements of large-scale production. Like the old breeds of animals, these birds flourish on a variety of foods they find on the farm and provide both eggs and meat. 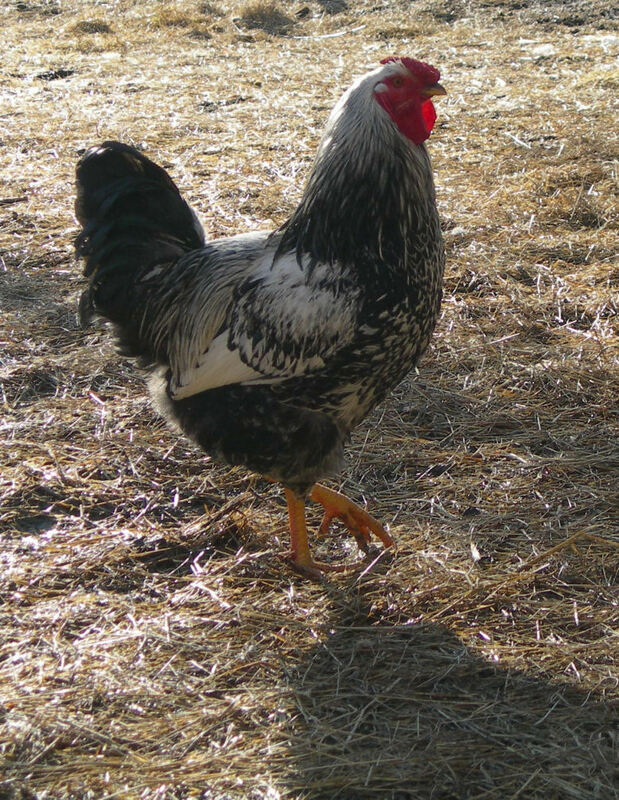 Currently we have Silver Laced Wyandottes, Black Australorps, Buff Orpingtons, Barred Rocks, and Araucanas, and mixed breeds from these types. The Wyandottes are handsome birds with white feathers tipped with green-black. They are sturdy in winter and their rose combs are less prone to frostbite than the upright combs of many chickens. Black Australorps were developed in Australia and introduced into American flocks in the 1920's. The tawny gold Buff Orpingtons, introduced from England in the late 1800's, have a quiet, gentle disposition and are great mothers to the chicks running around our farm in the spring and summer. Developed in New England in the early 1800's the black and white Barred Rocks are still known for their dependability as layers. 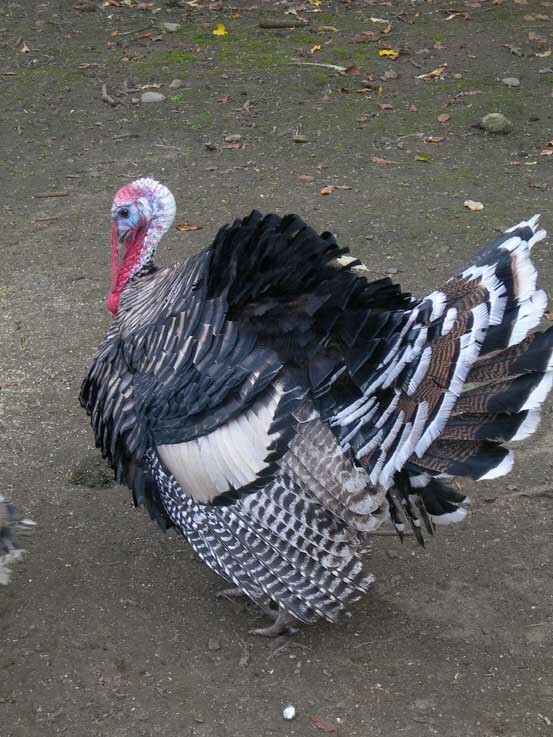 Araucanas have been called Easter Egg Chickens because of their blue and green eggs. Their name, however, reflects their heritage in Chile where they were first discovered being raised by the Araucana tribe of indigenous people. 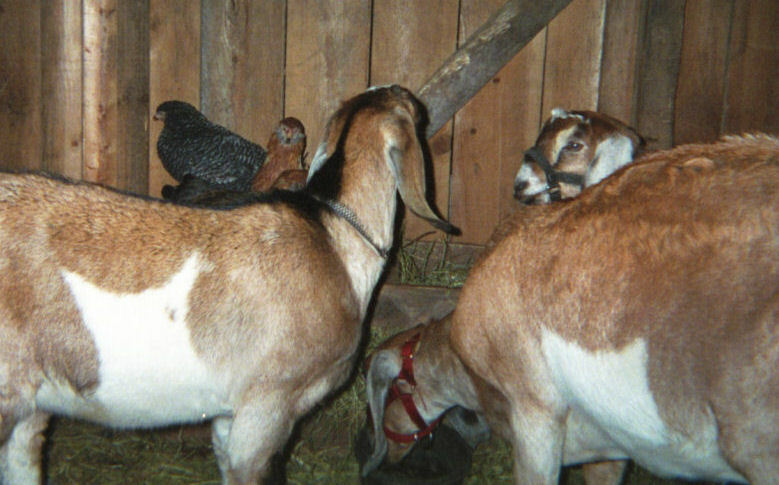 McMurray Hatchery is one site where you can get information about, and purchase rare breeds.